Microsoft's Windows 8 Consumer Preview should put to rest any doubts that the company wasn't serious about creating a touch-first operating system. So mice and keyboard PC users looking to upgrade to Windows 8 later in 2012, are going to have to get used to living in a touch-centric world. Unless Microsoft makes a major reversal in the coming months, that is. Not only do you have to deal with the new touch-friendly Metro interface borrowed from Windows Phone 7, but you're going to have to throw out your old way of navigating with a mouse and get used to the idea of hot corners. If you're unfamiliar with hot corners, basically you will be triggering system actions by hovering over the upper and lower corners of your screen. Here's a look at what you can expect when using a mouse in Windows 8 Consumer Preview. To sign-in to a Windows 8 session, you have to log in with your Microsoft Account (formerly your Windows Live account). But first you have to get past the Windows 8 lock screen. To do this you can either click and drag the picture up towards the top of the screen or just double right-click to get the sign-in page. To move between your desktop and the rest of your Windows 8 PC, you'll turn to where you always have to switch between programs: the lower left corner of the desktop. But you'll notice the Start button is no longer there. Instead you have a hot corner in the lower left that brings up a prompt to go back to the Start screen. This shows what is perhaps the biggest change PC users are going to have to get used to in Windows 8. The traditional Windows desktop is no longer the primary interface. Your PC desktop is now just another app that you switch into and out of using the Metro-style Start screen. Getting back to the Start screen from the lower left corner works whether you're in the traditional desktop or any other app. Just let your mouse hover over the lower left corner, and a mini-Start screen will pop-up. Clicking the pop-up will take you back to the Start screen. You can also right-click the Start screen hot corner to bring up a menu of features familiar to longtime Windows users such as Programs and Features, Network Connections, Device Manager, Command Prompt, Task Manager, Control Panel, Windows Explorer, Search, and Run. If you move to the Start screen hot corner when you're on the Start screen itself, the lower left corner acts as a back button, taking you to your most recently used app. Hover over the upper left corner of your screen to get back to your most recently visited app. Since Windows 8 is optimized for touchscreen devices, all Metro-style apps are presented in full screen, meaning you need a convenient way to quickly switch between previously used apps. To do this, you hover over the upper left corner of your screen. It doesn't matter if you're in the Desktop, the Start Screen, or any other app, the upper left corner will always let you get back to your most recently visited app. To see a selection of all your most recently used apps, hover over the upper left corner and then pull your mouse down towards the center of the left side of the screen. The BackStrip shows a thumbnail strip of all your recently opened apps. This will bring up a thumbnail strip of all your most recently opened apps. If you want to navigate between different screens inside an app--an example would be when you are moving between photos in the Metro-style Photos app--a back arrow should appear when you click or hover over the displayed content. The Windows 8 Charms Bar contains a set of system commands such as Settings and Search. The right side of your screen has one purpose: to activate the Windows 8 Charms Bar, which contains a set of system commands such as Settings, Search, Devices, and a link back to the Start Screen. The Charms Bar also has a share feature that, as its name implies, lets you share content with others. In my tests, I was only able to share content via e-mail, but that should change as more Metro-style apps become available and hook into the Windows 8's sharing feature. You can access the Charms Bar by hitting the upper or lower right corner. This will only bring up the bar, but the links won't be active, presumably to stay out of your way in case you triggered the Charms Bar by accident. An active Charms Bar will have a black background. Once you hover over one of the Charms, however, the bar becomes active. An active Charms Bar will have a black background. The Start screen has such a large collection of app tiles that it can't fit on one full screen so you have to slide the screen over to see the next set of apps. There are several ways you can do this. You can use the navigation slider that appears at the bottom of the screen, or, if your mouse has a scroll wheel, you can use that to move between app screens. In my tests, I could also use a two-finger gesture on my laptop's touchpad to scroll across all my Start screen apps. Metro IE puts the URL address bar and basic browser controls at the bottom of the screen. Windows 8 comes with two versions of Internet Explorer: one for the desktop and another touch-friendly Metro-style version. Metro IE puts the URL address bar along with basic browser controls such as stop, back, forward, refresh, and settings at the bottom of the screen instead of the top. To get rid of the browser bar so you can have a full screen view of your web page, click anywhere on the content you're viewing. To get back to the browser bar, right-click on an empty area anywhere on the page you're viewing. The right-click will also show you a menu of your open tabs at the top of the screen. You can also get to a Metro-style view of your frequently visited pages by clicking on the plus button in the open tab view. 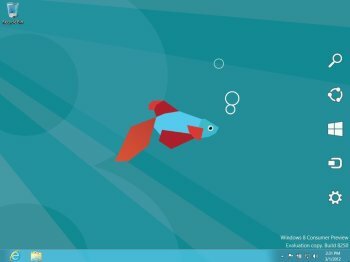 Navigating Windows 8 with a mouse is a little tricky, and somewhat confusing for Windows veterans, but once you get the hang of it...well, it's like navigating a touchscreen with your mouse.